Blog Will there be retirement communities in the WNAC area in the year 2040? 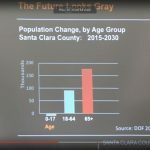 Projected growth of Santa Clara County different age groups in the year 2030. This New York Times article, published today, suggests that retirees are looking for more walkable and urban environments; one where a car isn’t needed. This is different than a generation ago. What do we need to do so that a senior who lives here can downsize in this neighborhood? As I have written before, I believe we have an opportunity to create a place where senior citizens live among the young, where the poor have decent housing and the rich can live in a place that is exciting and alive with activity from their fellow citizens. The ‘Humanitas’ care home for the elderly in the Dutch city of Deventer provides an example of one way to mix generations. At that facility, “Students can live for free there, as long as they agree to spend at least 30 hours a month socialising with the ageing residents.” As it turns out, both generations benefit from living together.